Liverpool were again left frustrated, with a typical Jose Mourinho-led performance resulting in a second consecutive 0-0 draw against Man United at Anfield. Liverpool were the dominant side, with 62% possession, 19 shots to six, and five shots on target to United’s one. However, Liverpool’s last shot on target was in the first half with the Reds failing to get a shot on target in the second 45. Similarly, Jurgen Klopp‘s side’s eight chances created all arrived in the first 45 minutes. Such statistics are part of a worrying trend this season, with Liverpool lacking goals and ideas late in games. Indeed, Liverpool haven’t scored any goals in the final 10 minutes or stoppage time of any game this season, with their latest goal so far this season being in the 77th minute – scored by Daniel Sturridge against Arsenal when already 3-0 up. That goal by Sturridge is the only goal scored by a Liverpool substitute in their 13 games in all competitions this season. Most daming, since that 4-0 win over Arsenal, Liverpool have won just one of eight games and have only scored one goal later than the 37th minute – that being by Jordan Henderson against Leicester in the 68th minute. This lack of second half inspiration is worrying, and the reasons for it could range from fitness issues, to a lack of ideas when teams sit back and defend deep. Frequently we’ve seen the likes of Mohamed Salah impress in the first 45 minutes, but struggle to influence the game in the same way in the second 45. It’s impossible to play at the highest intensity for the full 90 minutes, but again Salah looked to be struggling from the hour mark, and was withdrawn with 13 minutes to go. The major concern is that once it hits the hour mark and the opposition have formed their defensive shape, Liverpool struggle to break them down and the opposition get more comfortable. 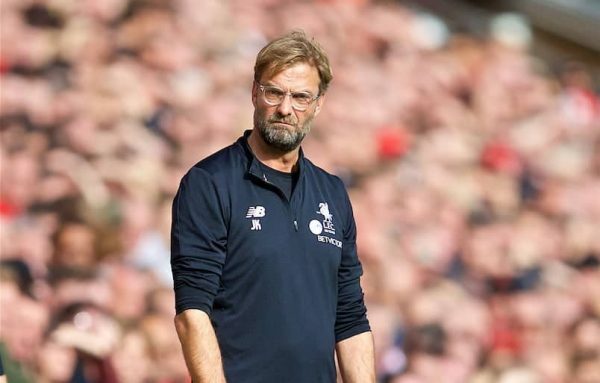 Klopp’s intense fitness regime and high-energy pressing game have been questioned in some circles previously, whether the demands the Liverpool manager places on his players is part of these lack of goals late in games isn’t clear. Scoring late goals is an important part of being a winning team, with the ability to score late winners having been the trademark for Liverpool in the eighties and then Man United in the nineties under Alex Ferguson.